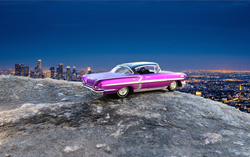 The high-end rental agency comments on a recent article that the Los Angeles Area is full of picture perfect destinations, but getting around the megalopolis will be a pleasure when driving in a stylish and ultra-luxurious vehicle. The right car make viewing the sights and sounds of L.A. all that much more special. Visitors on a business or pleasure trip might as well enjoy their time behind the wheel by renting a truly world class automobile. A December 27 article on Curbed Los Angeles reports on an end of year tally by Instagram on which sites in Los Angeles are most frequently featured in images on the hugely popular photo sharing site. The list was led by the Santa Monica Pier, followed by Universal Studios Hollywood, LAX (aka, Los Angeles International Airport), and the world renowned Hollywood Walk of Fame. Luxury Line Auto Rental notes that, while most of all these locations, and a great many more, offer the kinds of sights and sounds that can last a lifetime in memory, getting to and from them in a reasonable manner pretty much requires the use of a car. Moreover, the firm adds that the amount of time spent driving won’t be small; visitors on a business or pleasure trip might as well enjoy their time behind the wheel by renting a truly world class automobile. Luxury Line Auto Rental says that most people who have not spent a lot of time the Los Angeles Area have little idea of just how vast and spread out it really is. For example, a drive from the Santa Monica Pier to the Walk of Fame can, depending on traffic, can take between 30 minutes or over an hour. Driving from Hollywood Blvd. to the relatively close by Griffith Observatory will take another 30 minutes, says the agency. And a drive from the famed observatory to Beverly Hills for a gourmet dinner will take about 40 additional minutes, says the rental agency. It adds that these numbers can sometimes double or even treble when massive traffic snarls occur. Given the inevitability of spending that much time in your car during your Los Angeles trip, you might as well spend it in the comfort and style of one of the world’s best automobiles, says Luxury Line Auto Rental. The firm notes that it’s offering include some of the finest cars from world class auto makers, including Ferrari, Porsche, Mercedes Benz, Rolls Royce, and Aston Martin. On the other hand, if a driver’s L.A. fantasy is to ride a red hot convertible down Mullholland Drive or Sunset Boulevard, the firm’s open-air options range from the BMW 428i to the most iconic of all muscle cars, a Ford Mustang Convertible, says the agency. Luxury Line Auto Rental concludes by noting that the need to spend a lot of time in traffic isn’t really that much of a downside to the staying in the City of Angels when someone is taking the kind of car most people can only dream about driving. Readers are invited to contact Luxury Line Auto Rental at (310) 229-0001. They can also learn more by visiting it on the web at http://www.LuxuryLineAutoRental.com.